It looks like it’s legend meets legend at the Lost Colony’s Waterside Theatre this Sunday. Jefferson Starship will be landing on the stage as part of the Waterside Concert Series for the summer of 2015 this Sunday, July 12. Beginning as Jefferson Airplane in San Francisco back in the 1960s, the group evolved into Jefferson Starship when members of the original group began to leave and new members joined. Original members Paul Kantner and David Freiberg will be on hand along with Donny Baldwin, Chris Smith, Cathy Richardson and Jude Gold on lead guitar. 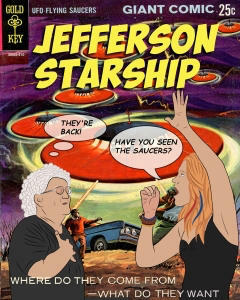 Jefferson Starship was cranking out hits for almost 20 years and their sound, while distinctive was never repetitive. Sunday should be a great evening of music. The list of hit songs dates back 50 years to Jefferson Airplane’s &ldquo;White Rabbit&rdquo; and &ldquo;Wooden Ships&rdquo; to the Starship’s &ldquo;Nothing’s Going to Stop Us&rdquo; and &ldquo;We Built This City&rdquo; in the late 1980s. The Waterside Concert Series will wrap up on Sunday, August 2nd with Resurrection-A Journey Tribute band that is considered the best at what they do..
Form more information about the Lost Colony or the Concert Series phone 252-473-6000 or visit them online. Joe Lamb Jr., & Associates &amp; Associates is a proud sponsor of the Lost Colony.